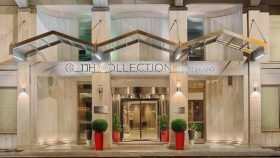 The NH Collection Roma Giustiniano hotel puts you footsteps from the Vatican and right on the doorstep of the Prati shopping district with its high-end designer stores. This hotel in Rome has direct connection with Vaticano City, St Peter’s Basilica, Sant’Angelo Bridge, Sant’Angelo Castle, Trastevere neighborhood and Rome’s historical center, meanwhile, is just 10 minutes away on foot. The 161 rooms are elegant and modern with hardwood floors and tea and coffee making facilities as standard. Some come with views of St. Peter’s Basilica or the Castel Sant’Angelo, which was built as a mausoleum for the Emperor Hadrian.